From now through December 30, you can actually get what you need, and a little satisfaction, too, if your travels take you through John F Kennedy International airport. 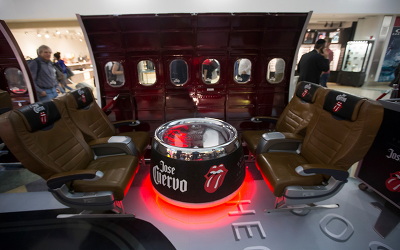 Make a point of stopping in the retail area of Concourse A at Terminal 4 to visit the pop-up Jose Cuervo Rolling Stones exhibit. Air Hollywood, a firm from California noted for creating airplane replicas and sets for the film industry (think, Kristen Wiig on that wonderful airplane scene to Las Vegas in Bridesmaids or the planes used in Wolf of Wall Street and Money Ball) has created a replica of the tour plane used by the Stones on their 1972 “party plane” North American Tour, set in an area covering 1500 square feet at the airport. At that time, it was Mick Jagger who reportedly asked for a tequila shot but was served a tequila sunrise instead. Mick was enamored of the orange juice, grenadine and Jose Cuervo creation and it became the drink of the tour, later dubbed the Tequila Sunrise Tour. And thus the drink’s fame began. This entry was posted on Sunday, November 29th, 2015 at 11:43 am	and is filed under Stuff to Do. You can follow any responses to this entry through the RSS 2.0 feed. You can leave a response, or trackback from your own site.